Matthew Dunn is a native of Georgia. He graduated from Ogeechee Technical College in 1999 with a diploma in Radiologic Technology. After completing his diploma and passing the certification examinations in Radiography and Computed Tomography, he worked at various hospitals and imaging centers throughout Georgia. Matthew holds a Bachelor of Medical Science Degree in Radiography Education from the Emory University School of Medicine and a Master of Education Degree from The University of Georgia. Matthew has taught Medical Imaging and Computed Tomography courses at both Emory University and Ogeechee Technical College. His current teaching focuses on Radiographic Physics and Technique, Radiation Biology and Protection, Radiographic Pathology, and Computed Tomography. He also serves as the clinical coordinator for the Radiologic Technology program and supervises all student clinical education rotations. Matthew is an active member of the American Society of Radiologic Technologists, the Georgia Society of Radiologic Technologists, and the Georgia Educators Association of Radiation and Medical Imaging Society. Jan is the Program Director for the Radiologic Technology program at Ogeechee Technical College in Statesboro, GA. She graduated from Memorial Medical Center School of Radiologic Technology. Jan has held positions as staff radiographer in hospital and orthopedic office settings. Jan has a Bachelor’s degree in Healthcare Management from Ottawa University in Overland Park, KS. She recently completed her Master of Arts Degree in Organizational Management from Ashford University in Clinton, Iowa. She has been a volunteer for Ogeechee Area Hospice Inpatient Center in Statesboro for the past 10 years. She received a Deen Day Smith Service to Mankind Award in April 2011 and was chosen as Ogeechee Technical College’s Instructor of the Year in 2011. Prior to beginning clinical rotations, students must complete a background and drug screening. See program faculty for specific details regarding the process of completing the background check and drug screening. Eligibility requirements for ARRT certification in Radiography, effective January 1, 2015 has mandated that all candidates must earn an associate (or more advanced) degree from an accrediting agency recognized by the ARRT. Beginning fall semester 2012, all students entering the Radiologic Technology program must meet the degree core requirements outlined in theHealth Care Science Certificate. Click here to view the Competitive Admission Process. Graduates are eligible to sit for the certification examination given by the American Registry of Radiologic Technologists (ARRT) and must pass to become Registered Technologists. However, the ARRT has a policy of not allowing persons who are convicted of a felony or gross misdemeanor to take the national certifying examination. Because of this policy, there may be an inability of those with such a conviction to work in the profession. 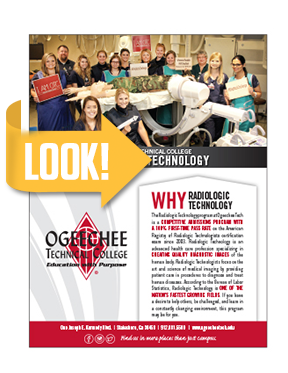 Ogeechee Technical College's RAD Tech program has surpassed the National Pass Rate since 2005. Click here to view the National Comparison Report. Click here to download the Ethics Review Pre-Application. Students will use effective oral communication skills with clinical staff. Goal 4: Students will promote professionalism. **Denotes a competitive admission program. 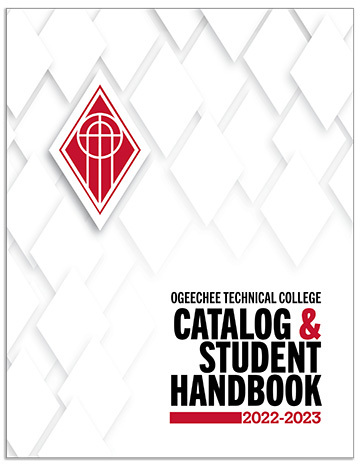 View the OTC Catalog and Student Handbook for details. The purpose of the Radiologic Technology program is to provide educational opportunities to individuals that will enable them to obtain the knowledge, skills and attitudes necessary to succeed as Radiographers. The mission of the Radiologic Technology Degree program is to provide educational opportunities to individuals that will enable them to obtain the knowledge, skills and attitudes necessary to succeed as Radiologic Technologists. Q: What is the Radiologic Technology Program? A: The Radiologic Technology associate degree program is a sequence of courses that prepares students for positions in radiology departments and related businesses and industries. Learning opportunities develop academic, technical, and professional knowledge and skills required for job acquisition, retention, and advancement. The program emphasizes a combination of didactic and clinical instruction necessary for successful employment. Program graduates receive an associate of applied science degree, have the qualifications of a radiographer, and are eligible to sit for a national certification examination for radiographers. Q: What are the prerequisites for the Radiologic Technology Program? A: Students must complete nine (9) courses in the Health Care Science Technical Certificate of Credit. Q: I have a Bachelor’s degree, will any of these courses transfer for the Radiologic Technology Program? A: Official transcripts are reviewed for transfer in the Registrar’s office in Student Affairs. Transfer courses are evaluated with courses taken at OTC for GPA calculation. Although many courses may be transferred to satisfy requirements, most prospective students have not completed all of the required courses. For example, RADT 1010 – Introduction to Radiography is not a course that is typically transferred and must still be completed to satisfy the entrance requirements. A: The curriculum for the Radiologic Technology Degree program is designed for the semester system. A student may enter the program in spring semester. Q: How do I apply to the college? A: For information on how to apply, click here. Q: How many students are accepted into the program? A: The program accepts twelve (12) students every spring semester. Due to clinical site availability the number of seats are limited. Q: What is the PSB-Health Occupations Aptitude Exam? A: This exam is composed of a battery of tests that measure abilities, skills, knowledge, and attitudes necessary for a student to complete a chosen program successfully. The exam is given several times during the semester. A student will be allowed up to four testing attempts for the PSB – HOAE. A student is required to wait a minimum of 30 days between the first and second attempts. PSB scores from other schools will not be accepted. A student will be required to pay a $25 retest fee for the 2nd attempt. If a student requests a 3rd or 4th attempt, the student must wait 6 months following the last attempt and pay a $25 retest fee for each additional attempt.